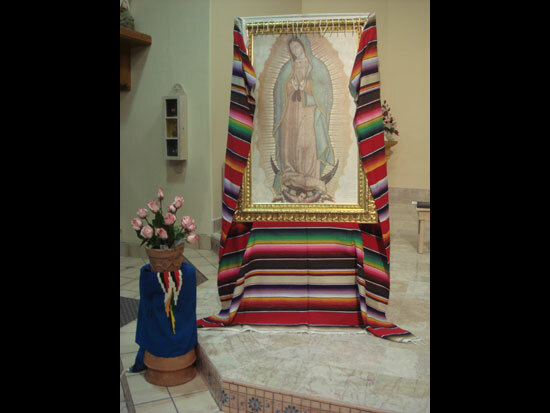 This is a replica of Juan Diego’s cloak with the miraculous image of Our Lady. Father Ricardo performed as Juan Diego during the celebration of Our Lady of Guadalupe on December 12, 2009. Pilgrimage and Eucharistic celebration at the “A” Mountain. Roses and colorful “zarapes” are used to decorate the church. The Piro-Manso-Tiwa Tribe dance in honor of Our Blessed Mother. The Piro-Manso-Tiwa Tribe dance in front of the church and keep and old tradition. Some of these people are taught to dance by parents and grandparents. At the rhythm of the drums the Indians dance.